If you had a cruise ship with no passengers, it wouldn't matter how decked out with luxurious and useful amenities, fantastic movies, art and music it was, or if it had a great cruise director to organize the guests and activities. With social media, just like with like parties, having the ship all to yourself is not a good thing. 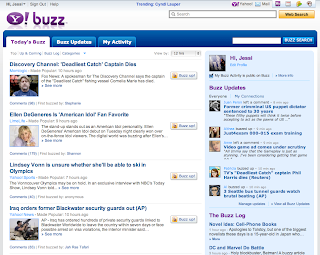 For two days now the buzzers have been buzzing about Google Buzz. 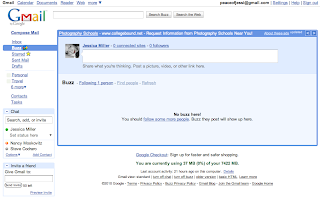 The Google gaggle clammered, "Google's got a Facebook. It's Google's new Twitter. It's got update streams, comments and media sharing, right in your email!" My first reaction was, "Oh, like Yahoo?" Note the "buzz up" button at the bottom of this blog. It's not for Google Buzz, it's for Y! buzz. That's Yahoo. 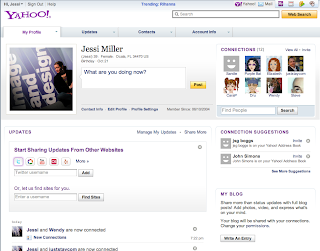 Yahoo has had it's own social network for years now, since Facebook was an infant. The Yahoo 360 Beta, which was great like MySpace in the beginning, finally closed in 2009 because not enough people were on it. 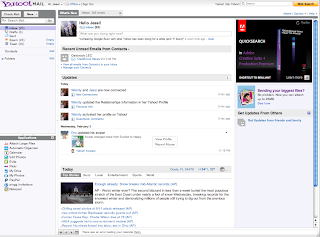 Yahoo integrated much of the 360 info right into their regular profiles. I can blog, update, comment, connect to other people, media sites, apps, get feeds and news, and so on right from my Yahoo email or home page. I know Google is big, I know they're everywhere, they even ran my favorite Super Bowl commercial. But sober up techies, another social network is just another social network, no matter who owns it and this is sort of a knock off of Yahoo anyway. So it's not benefits we're comparing, it's location. Where do you spend your time? Do you feel like relocating everyone you know and all of your information? If you already use gmail as your hub, it will be great for you. If not, it's just another added feature that lives there. I don't see all the bees buzzing away from Facebook, Yahoo, Twitter or whatever hive they've already built, I see it as simply a benefit to gmail users. PS: click the "buzz up" & Digg buttons, please and thank you! How many of you still have a ribbon you received for a painting, a clay pot or maybe the long jump in elementary school? Or a medal for gymnastics or ballet? How about those bowling and wrestling trophies? Special awards for achievement in college? Plaques and certificates from professional organizations? We are an award-crazed culture, and while some of them seem bought or gratuitous, the good ones help keep us in line, help good creative thrive, inspire innovation and yes, make us feel all warm and fuzzy if we win. We have loved reward, recognition and attention since we were infants, when just a smile from our mother meant ultimate success. It's part of our basic human need for significance, and sometimes I think creatives in the advertising/marketing field (along with those in entertainment) got more than our share of that craving. We're all grown up and in the cold, hard, competitive world now and our successes don't happen by virtue of existence and a smile alone. Our mothers were much more liberal with the "good boy/girl" praise than the ADDY judges are, which contributes to the coveted National ADDY ranking within a few steps of the holy grail. Professionally speaking, of course. What's so great about the ADDYS? First of all, it's hard. 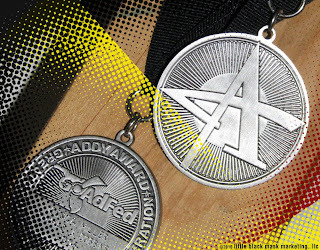 If you win a National ADDY Award, that means your work has made it through three rigorous competitions, three different sets of qualified judges from all over the country, with three different sets of competitors at each stage. Local. District. National. Over 60,000 ADDY entries are judged each year for their creative excellence – first in an entrant's local area, then at a larger regional level (in my case it's the 4th District which includes all of Florida and the Caribbean), and finally at the national level where the big dogs run. Win at national, and your compadres are the biggest agencies in the world. "Hello BBDO, DDB and Satchi & Satchi, nice to stand on the same stage with you today!" Second of all, it's hard. Every year I marvel at the magnitude of it. Imagine if you will, the people-power it takes to run 200 competitions locally before moving up to the larger districts then national. Imagine how many judges are traveling during ADDY season, how many entries are being shipped, opened, displayed, put away, shipped, opened, displayed and put away again. Imagine how many showbooks are being produced, how many winner reels for galas are being made, how many party themes are being dreamed up, and just how grueling it all can be. Now imagine that it is all done by volunteers. Maintaining the highest standard of integrity, fairness and quality takes a lot of knowledge and experience... and passion. Thousands of people enthusiastically spend time away from their families and jobs, pouring their energy into running top-notch competitions across the country. Third of all, respect. I just took Sally Hogshead's fascination test and "prestige" came up as my top fascination trigger. That means I really value awards (at least those that are really worth having, only the prestigious ones)! If your first thought is that it's about vanity, think again. In life we all are salespeople, we've got to wave our own flag high or no one will see it. Professionally we spend most of our time showing or telling people how great we are so they will give us their trust and money. I can run around all day and night saying that I'm good, but an ADDY says it for me. Let's face it, even a great portfolio isn't always proof enough to a client who doesn't understand the power and reason behind visual communication. An ADDY says "award-winning," and that means respect. I stand on both sides of the ADDY competition process. I judged two different competitions in Florida this year, have judged others in the past, have been local ADDY Chair and and district ADDY Judging Chair, and I enter my work. No matter how much I am involved behind the scenes, I still never know how my work will be judged. The Ocala ADDY Gala is February 18th, wish me luck, I won't know until then how I fared this year! Good luck to all of you entrants out there, of ADDY and other competitions. Keep reaching high and stepping up your creative, and keep supporting other winners around you. They deserve a smile, some applause, an "atta boy," an award... some validation and respect for their good and hard work.